One morning, Grandma came by our kitchen and said something I couldn't understand. She repeated several times and I still couldn't get it. Finally I realized she was saying "Good morning," but it sounded like "moni"! *The name Cameroon comes from the Portuguese language. Portuguese explorers were the first on record to arrive in the Douala area, and they came at a time of year when the estuary was full of shrimp-like crustaceans, the mbeatowa. The Portuguese called the area "Rio dos Camerões" (River of Prawns). One day a new American woman appeared in Douala, Tilda*. She did not arrive with a Cameroonian spouse, nor was she with the Consulate or the Cultural Center. From what I was able to gather, she had left corporate life in the United States to come live in Africa. Hearsay was that she had been swindled out of her savings by an African man (not a Cameroonian, but I don't want to sully any national reputation by saying which country he was from). She created a (in our eyes) modern chicken farm: sheds with many chickens living in them, across the river in Bonabéri. She delivered to our homes, minimum order: 5 chickens; she also sold eggs. After several years eating what we called "Bicycle Chicken," i.e. chicken that has lived its life running around and pecking earth, with muscles as hard as the winner of the Tour de France, we were quite grateful to have tender, albeit small and more expensive, chickens. I perceived that Tilda was struggling financially. She certainly didn't seem to lead anything even close to a comfortable life. However unenthusiastic and even bitter about her life in Cameroon, however, Tilda indicated that she was unwilling and/or unable to return to the U.S.
After I left Cameroon, I did not hear anything about her, until last year, when a common friend wrote me that she had been run over by an automobile while riding her bicycle. Rest in Peace, Tilda. Recently, thanks to @Design_Junkies on Twitter, I discovered Skyler Vander Molen's graphics for an "Africa" T-shirt. I loved the creative, and found Skyler's website, to email him that I'd like to share the graphics with readers of this blog. This is the link to the graphics. Skyler explained that he had created the T-shirt to raise funds for a humanitarian trip to Rwanda. From the website: "Global Peace Exchange is a student founded and run non-profit begun at Florida State University. In 2008, GPE took a team of 20 volunteers to Rwanda to help build an IT school and teach English. As a volunteer, it was our duty to raise money for the trip. As part of my contribution, I designed a t-shirt to raise awareness about Africa as well as raise money." Don’t call out my name. In Duala culture, before colonization, and still the case in many families, every person had a given name that was followed by the father’s name. For example, Ebélé Billé is Ebélé, son of Billé. However, nobody ever calls the person out loud by their name. As most probably a forebear held that name previously, to call that name out would unnecessarily disturb the deceased forebear. A less common stew is made with kiling-kiling – a slightly slimy leaf, chopped, and cooked with crab, served along banana leaf-wrapped dumplings made of ground makabo. Another less-everyday dish is Mandja Moto - tiny whole fish (about the size of a little finger) - stewed in a tomato sauce. We often had to make business trips out of town to visit sites. One of our clients wanted to revise the layout of a home he had already started building, in Ndom, about 128 km from Douala, towards the northeast. Part of the road was highway, and the other part was on dirt roads, the infamous red laterite,* otherwise known as “tôle ondulée,” i.e. “wavy metal roofing”: very, very bumpy. It took six hours to reach our destination, by which time I felt like I had been shaken around in a salad wringer for several hours. We were to stay overnight at the client’s brother’s home, a more rudimentary style of housing, with no inside plumbing. There were only 2 rooms, so as we were a large group, the men slept in one room and the women in another. In the middle of the night I felt like going to the restroom: however, I was scared stiff of going to the outhouse, which was located several yards behind the house. I was convinced that a pack of wild animals would find me. I preferred to wait till morning. In the morning, as I brushed my hair, I hoarded any hair that was in the brush, as I had been warned about “white people’s hair” being quite a prize for the local witch doctors. True or not true, I wasn’t taking any chances! After the site visit the next day, we regrouped into different cars for the way home. Our client’s brother convinced us that he knew a shortcut. Of course we trusted him; after all, he had been raised in the region. 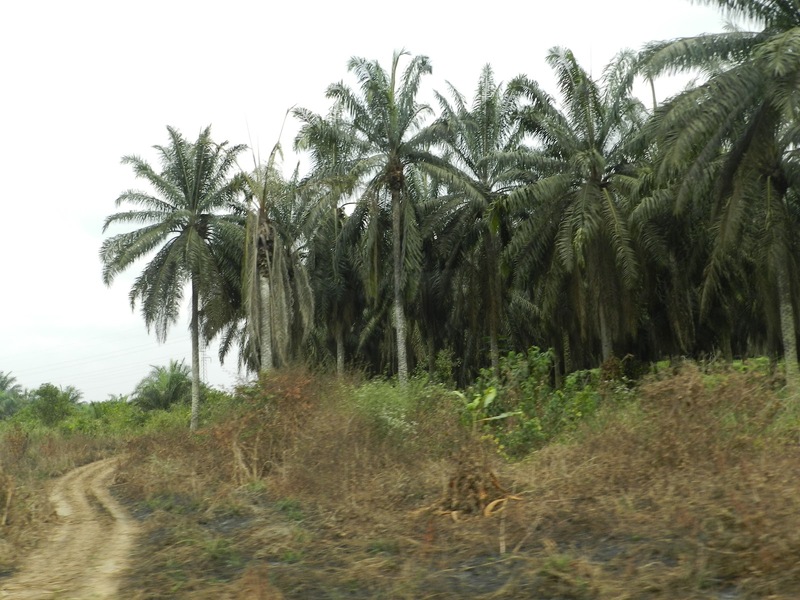 We drove along winding roads and precipices, to finally reach Douala well after everybody else. After that, our code name for that brother was “shortcut” (“raccourci” in French). A less humorous fact in Ndom was that a local farmer was about to lose an entire harvest of pineapples, because of the lack of decent roads to transport the merchandise. We heard that, in the meantime, a paved road has been built. "It takes a village to raise a child." As hopefully most people know, this is originally an African saying. It certainly was true when my husband was growing up. The village in those days was still very close-knit, and many inhabitants were related to each other, either through blood or through marriage. Late one evening, my husband and I were returning from a stroll in the neighborhood, and noticed a teenager still outside. My husband told him to go home immediately to his parents, and kept an eye on him till he was sure he was on his way home. I was surprised; in Europe and in the United States, other people's children are none of our business. However, this was, and still is, not the case in many areas of Africa. If you saw someone’s child, even if that child was already 6 feet tall, doing something he/she shouldn’t be doing, you had the duty and the right to scold the child. The parents’ child wouldn’t think of telling you off for it (and there was a good chance the child might not even dare tell them, for fear of being scolded again!). 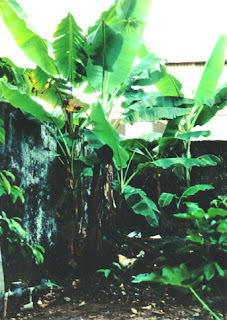 Some dishes are steamed wrapped in banana leaves—the old-fashioned, eco-friendly, and tasty version of aluminum foil—the Dualas make Ekoki (from the sound of the pestle - Mboloki - pounding in the mortar - Eboki) The basic Duala Ekoki is made from ground beans similar to black-eyed peas, mixed with red palm oil. 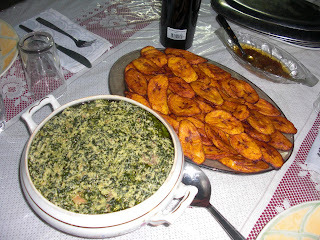 Another version is made with ground corn with Mbaa leaves. Another banana-leaf-wrapped loaf is Ngondo nya Mukon (pronounced Ngonda’Mukon), most often made around the holiday season at year’s end. It is a cake made of ground pumpkin seeds, ground dried shrimp (Dibanga), and filled with beef or shrimp, sometimes smoked fish. 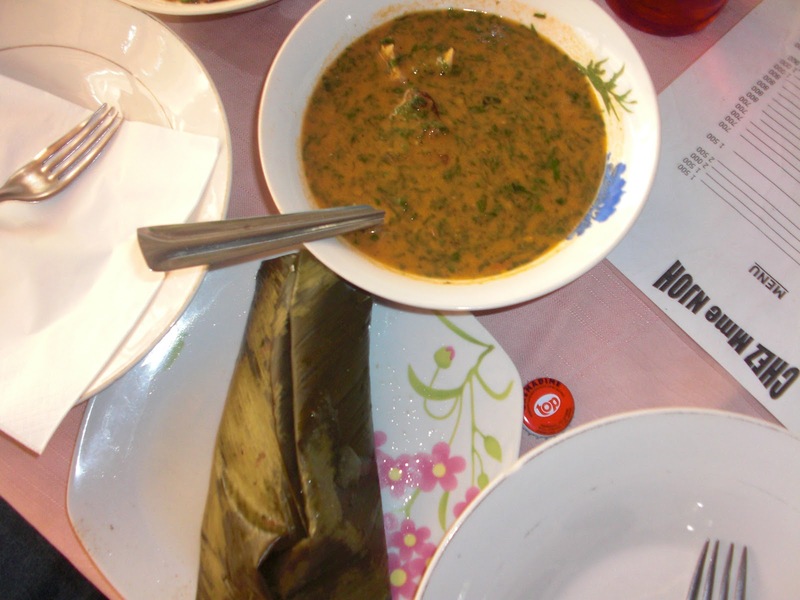 A Duala leaf-wrapped stew is Suwé nya Dibomba – fish in banana leaves. My personal favorite is Bekwang, ground Makabo (similar to a dense potato) wrapped in leaves, served with a Kiling-Kiling leaf sauce (slightly slimy, similar to okra). The Béti make a stew called Ndomba (fish or game) which is also cooked in a banana leaf wrapping. The Bassa, from south-central Cameroon, make a very tasty leaf-wrapped fish stew called Mbongo Chobi, whose sauce is green-black. A nice rainy day dish is Pépé Supi, a thick soup made with Makabo (a type of very dense local potato), basil (called Kotimandjo in Duala), spiced with hot Scotch Bonnet, Djangsang (a local spice that looks like a chickpea but has a very distinctive taste), and Pébé, another local spice in a hard shell. 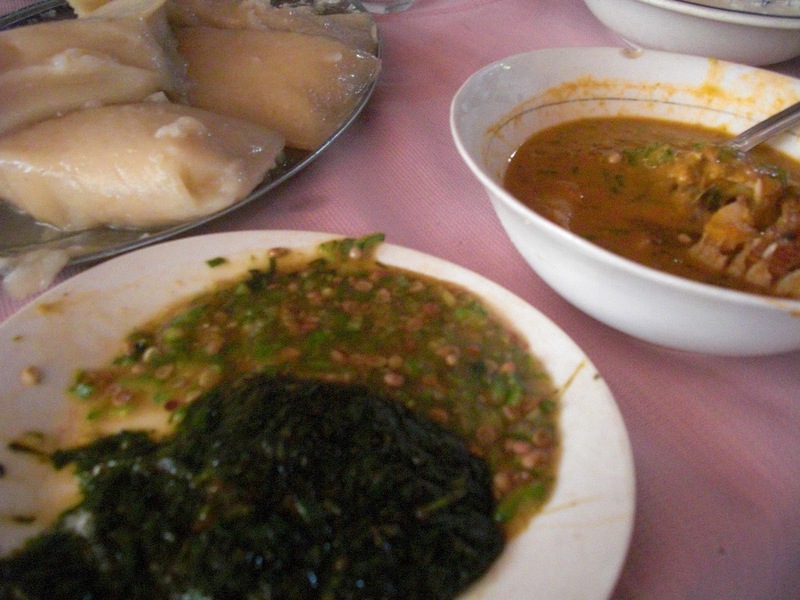 Before moving to Cameroon, I thought I knew all about the world’s foods. I was raised on American and Middle Eastern food, and was later introduced to a variety of European, Asian and North African cuisines. At the beginning of my life in Cameroon, I’d often have lunch at my in-laws, who lived next door (we shared the same compound). One day, there was a heaping dish of light orange-colored sliced plantains. I thought to myself, “I didn’t know they used curry here!” and helped myself to a plateful. At the first bite, however, I realized my error: these plantains had nothing to do with curry. The orange-colored seasoning was red palm oil, and it tasted unlike anything I had ever eaten before. At that point, I really didn’t like it, and I thought I was not a fussy person! The dish is called Miellé ma Sésé. The plantains are boiled and then mixed with the palm oil, and shaken till the oil has coated everything. Food in tropical Africa, as everywhere in the world, is mainly made with local products. Notable exceptions: tomatoes have become a staple, after being imported by the Europeans who had themselves imported them from South America. Tomatoes are not quite as ubiquitous as in southern Italy, but are the go-to item for sauces when a cook is in a crunch. Another import is salt cod, also known in the Americas as Bacalao. Cooked with what else... tomato sauce! Onions are also very popular, and I don’t think they are originally from the African continent. Food, traditionally, is cooked. Well cooked. Salads used to be an unknown entity, and older people still call it “goat’s food.” Raw, or insufficiently cooked, would have been—and may still be—dangerous, in the hot and humid equatorial climate, where bacteria thrive, as it is never cold. Snow is a completely unknown entity. Even after a third of his life spent in temperate climates, my husband will not touch a piece of fish sushi with a ten-foot pole! Meat and fish are either stewed, grilled over a wood fire, or fried. 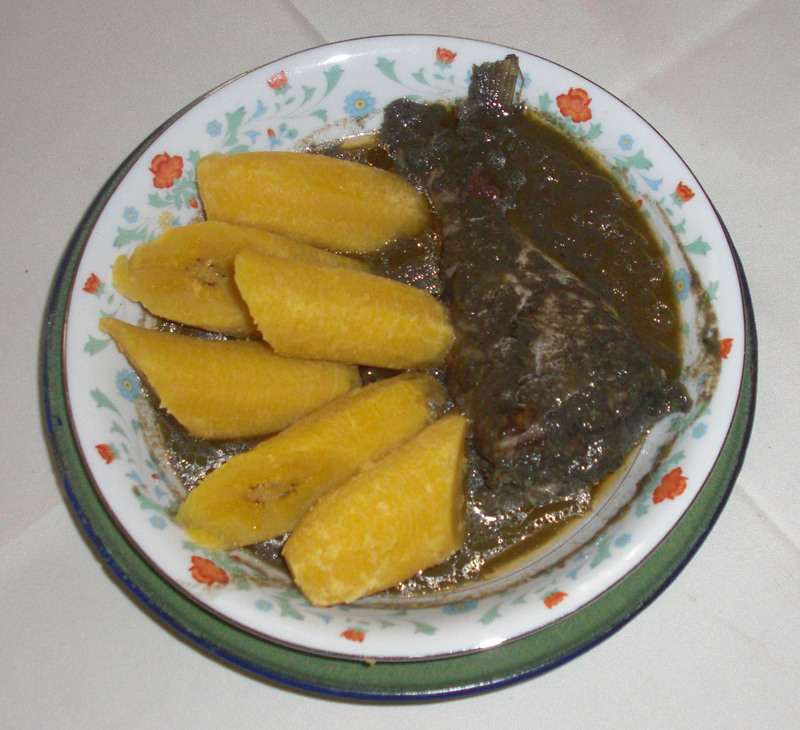 The most famous Duala dish, and arguably the most famous Cameroonian dish is Ndolé. It’s a stew of groundnuts (finely ground), ground dried tiny shrimp called Dibanga, finely chopped Ndolé leaves, and a protein: meat, dried fish or shrimp, usually. 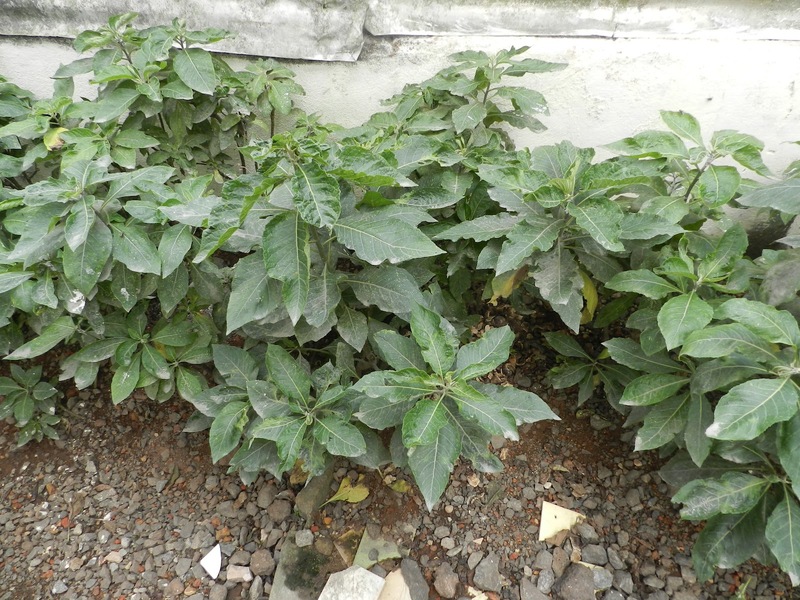 Ndolé leaves are from a bush, aptly named “Bitterleaf,” in English-speaking African countries, because before the leaves are boiled/washed in water containing kaolin clay, they are indeed unbearably bitter and are used to treat stomach ailments. Ndolé is served either with boiled or fried plantain bananas, or with Miondo, otherwise known as cassava sticks: fermented cassava wrapped in leaves*, and boiled. To eat the Ndolé with Miondo, you unpeel a Mondo (singular), which is a little sticky, fold it, dunk it into the stew and bite a piece off. Miondo are typically Duala; however, the Béti, from the center of Cameroon, have something similar, Ebobolo, much thicker than Miondo. 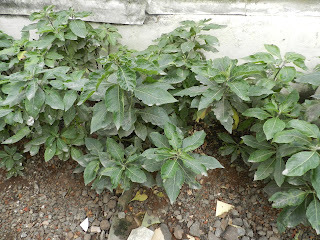 *Leaves are either Bendomban – a plant growing in the wild; or banana leaves, when Bendomban is not available.